Shortly after the Parisian Bloggers Meet-up in October of 2009, where I met Lily of Context Travel, Mr. Misadventures and I read a little blurp in Business Week (followed by an article in Condé Nast Traveler) about the concept of context travel and remarked that finally this was the way to do a “tour.” Not those obnoxious things with thirty people getting on a bus, stopping at a monument and spending 5-10 minutes taking photos and maybe hearing a few historical highlights. Finally there was a tour, small in size, led by people (always locals or expats who have lived in the place a significant amount of time) in a particular field (like food, or architecture, or art) who were experts. Who take the time to really dig into a particular topic, or neighborhood or even just a street. An experience that allows you to begin to really understand a place. Having never, ever done a “tour” of any kind, I was intrigued. I made a mental note to check out a tour in the future. Little did I know that it would take more than two years to make that happen! Before doing one in Paris, in December of 2010 I went to Beijing and the only part of my trip that I enjoyed was the two half-day tours I took with a local that my colleague traveling with me was familiar with. The tour guide was local, personalized our time and absolutely made my trip. After that experience, I knew that I must figure out a way to work in a tour in Paris. So when the opportunity came up to meet Mr. Misadventures for a long weekend in Paris and that I would actually arrive a day and a half before him, I knew I had my chance. I booked two tours through the website and anxiously awaited for confirmation. Happily Lily contacted me and let me know that not only was my tour confirmed but that none other than Meg Zimbeck was going to be my docent! Meg is the founder, editor and key contributors to one of my favorite food blogs, Paris by Mouth. Not only are they an extremely useful website for anyone visiting or living in Paris, I have a total blog crush on them! I was beyond thrilled to meet Meg. So the morning after meeting some of my friends for dinner I met Meg and three other people in the 7th arrondissement, the chic Left Bank, to begin my tour. We were specifically in the Rue de Bac area where Ms. Julia Child lived and shopped herself when she lived in Paris. Now I am not going to go through every detail of the tour because I want you to take it for yourself (and you really, really should! ), so I am just going to give you a little peek at where we went and what we did. 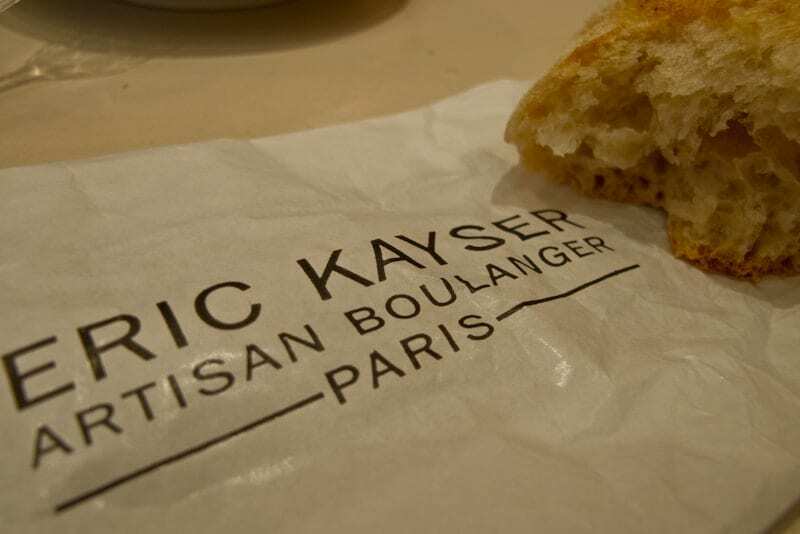 We started out visiting an Eric Kayser boulangerie and Meg spent time (over coffee) explaining why Eric Kayser is important and how to spot a good baguette. 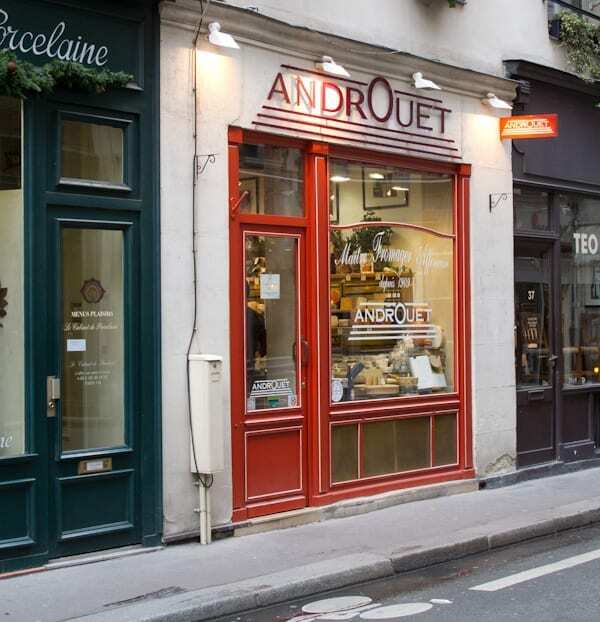 After learning all about baguettes we took our purchased bread across the street to the Androuet cheese shop (or fromagerie), the very shop where Julia shopped, to learn a little bit about one of the most symbolic foods of France. I love cheese. Maybe not as much as Chez Loulou, but I love it, and there aren’t many cheeses that I have met that I didn’t like! So I was definitely looking forward to this part of the tour and since we would be sampling on a very bread, I was ready! There are so many cheeses in France that it would take a very long time to try them all, but Meg gave it her best shot selecting several for us to try. 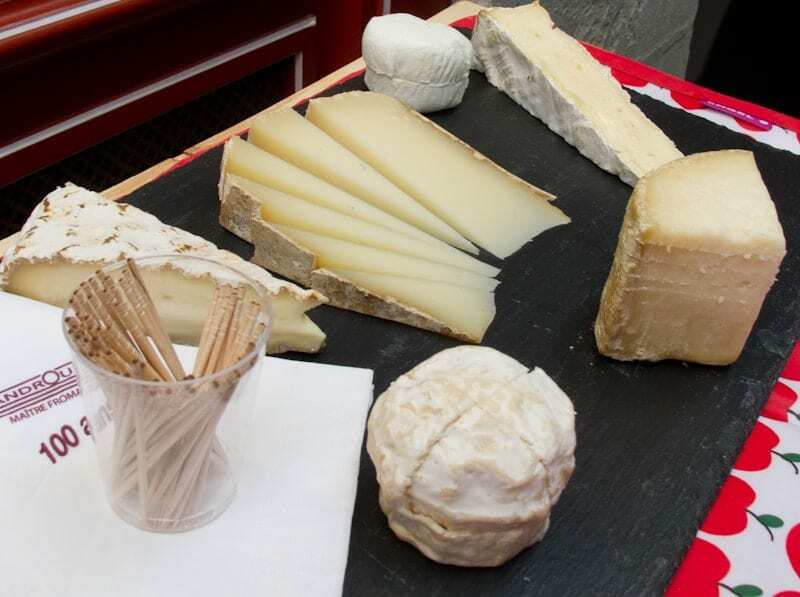 I’ll share a little more about this part of the tour and what I sampled as the choice of cheeses is different for each tour depending on what is good that day (according to the affineur in the shop) and what is in season. These are the ones I sampled. There was a Rove des Garrigues, a very young 7-day old goat cheese with wonderful lemony undertones. 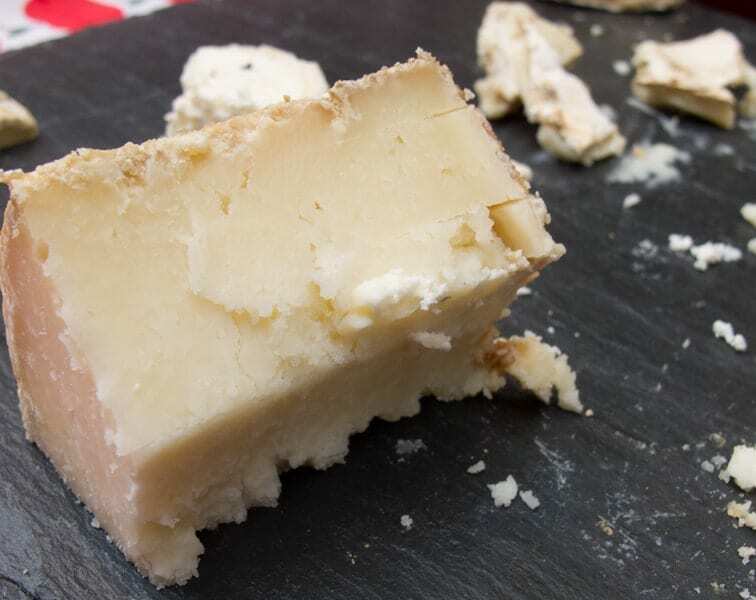 Then the Ossau-Iraty, a semi-soft sheep’s milk with a wonderful nutty taste. This was followed by two bries, a brie de Meaux which is the most similar to what we see in the U.S. and a brie de Melun which is stronger and saltier because it is more aged. 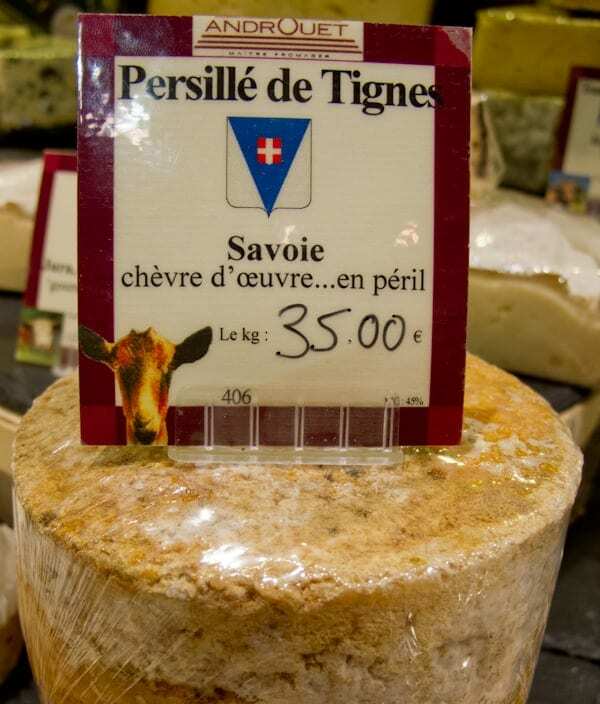 Next was a very special cheese, a goat and cow cheese that is, at this time, rare due to the fact that it is only currently being crafted by one producer and he has no successor, it is called Persillé de Tignes. It tastes like heaven. I would call it rustic, a farm cheese with a wonderful crumbly texture. This is the one I sampled the most, as who knows if and when I will ever be able to try it again? We ended with a Gaperon, a cow’s milk cheese from Auvergne with a nice pepper and garlic taste. We made our way around the plate again making quick work of the once pretty display. After such a savory experience, the only thing left to do? Chocolate of course! 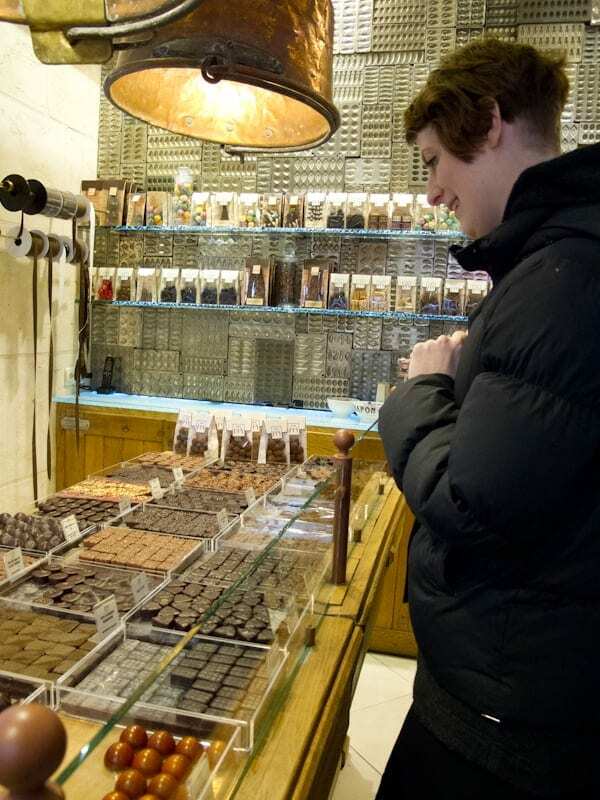 Meg took us through a little lesson in chocolate, allowing us to sample as she went. We finished up with a taste of Chapon’s amazing chocolate mousse. I personally had never had mousse served this way, but it is absolutely decadent and I could only “handle” a few bites. Completely stoned on chocolately-goodness I temporarily said good-bye to Meg (as I would be seeing her for another tour in the afternoon) and made my way up Boulevard St. Germain, smiling all the way. Bottomline, it is an excellent tour, given by an extremely knowledgeable guide, and I highly recommend it for any foodie visiting (or living in) Paris. For more info on Context Travel tours in Paris, visit their website. You you should know that Paris is only one of the locations that this amazing company operates tours in. I say amazing as Context Travel is a company that practices and deeply believes in sustainability, they have even created the Context Travel Foundation for Sustainable Travel and operate as a certified B Corporation a relatively new kind of company which uses the power of business to solve social and environmental problems. How about you? Have you ever partook in a Context Tour? How about other similar tours? What do you think about tours in general? Ossau-Iraty has become my new favorite thanks to that tour!!! So glad you had a good time too =) Wasn’t that chocolate mousse cone just divine??? @Lindsey, it was a great cheese exploration! That mousse should be illegal! @AndiP, it was a blast and a must for foodies, come on an empty stomach! So this was a food tour? Looks amazing! @Jennie, food and some food history, it is yummy, but go on an empty stomach! A food tour, I spent hours trying to figure out this using Chowhound posts and a Lonely Planet guide. PS Try a bike tour. I don’t know if they have MIke’s Bikes, but it was great to connect with others if you are traveling by yourself. Also staying in a hostel is another way to make friends. @ZombieMommySaves, a bike tour sounds fun, I saw a Segway tour going on while I was there, looked interesting (not sure I am coordinated enough!). 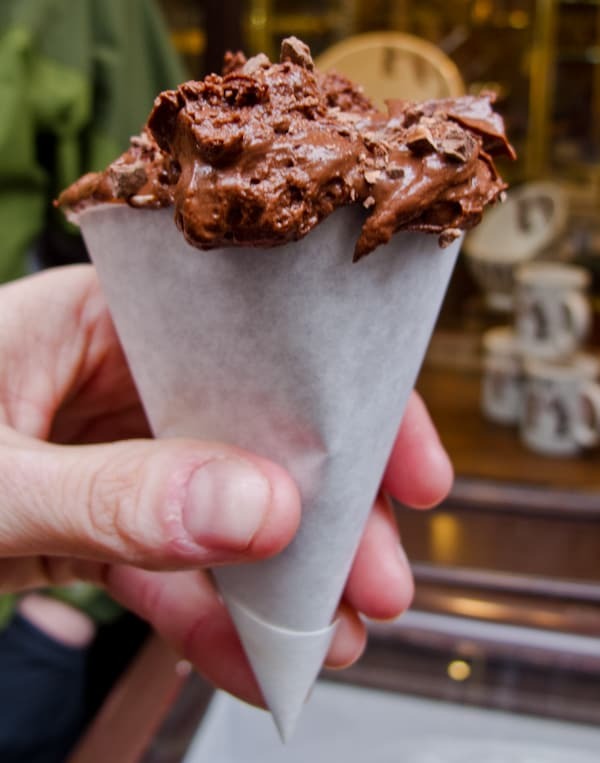 “Don’t leave Paris without trying this” Forget the other tours in Paris. Segway Tours will make your stay in Paris a lot more enjoyable. Out of our 4 days stay in Paris, touring the city on a Segway was the highlight of our trip. I would like to recommend our tour guide Rick, he was able to make Paris a lot more fun, interesting and enjoyable. We saw Paris at a different light with cool facts and trivia. We wouldn’t think of coming back to Paris if it weren’t for the Segway Tours. Definitely a must try for everyone. Thank you for this post. I’ve never heard of context travel before. My husband and I are very interested in trying new things.